If you were to look up the definition for vinosity you would see two. 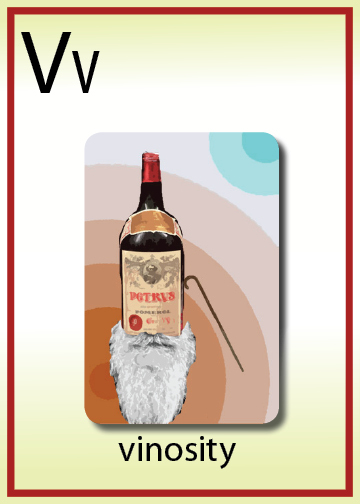 1) Relating to, or the characteristic of wine. 2) The indulgence of wine. When we blind taste in my sommelier group we add a third definition, vinosity is the expression of a wine’s aromas and flavors as it begins to develop and age. When I was growing up there was an old man who lived next door, Mr Prity. When I was about 11 years old he was quite scary. He would always spy on us through his window making sure we were not on his property. He was down right mean. There he stood with a cigar in hand, eyeing our every move just waiting for our ball to go into his yard. One could say that he had a lot of tannin and acidity. By the time I was 18 years old, he reached 90 and although his skin became more leather like, he was more approachable. He’d come out and talk about the Chargers and the weather. It seemed that as he aged he started softening up. He still had a grouchy side, but he became much more pleasant and I no longer feared him. When I was 30, I returned home to visit my parents and Mr. Prity was still alive and kicking at 102. This time he invited me into his home and poured me a scotch. He was gentle like a delicate violet. He opened up and shared stories about how he watched us grow up. It seemed as though with age he became quite enjoyable. He joked around and was engaging. The grouchy streak was lost. Mr. Prity had become like I fine wine which had reached its peak. Mr. Prity lived to be 104 years old. Back to my definition of vinosity. Vinosity is the characteristic of wine. In our group we refer to a wine’s vinosity as the characteristics that the wine shows as it ages. When we first put our nose in the glass during a blind tasting we decide if it is youthful or vinious. A youthful wine is fruit forward and shows primary aromas, where as a vinious wine shows more complex secondary and tertiary aromas. In order for a wine to begin to show vinosity in a favorable way, such as Mr. Prity, it needs to have the same tannin and acidity that Mr. Prity had. Tannin and acidity allow the wine to age long enough for us to enjoy its vinious aromas and flavors of cigar box, leather and violets. It took 100 years for Mr. Prity to open up and for me to see his true nature. Many wines need to be aged before we can really begin to understand them. Try setting some wines aside, do not be too vinious (indulgent) and see the wine’s vinosity develop and express its true nature.